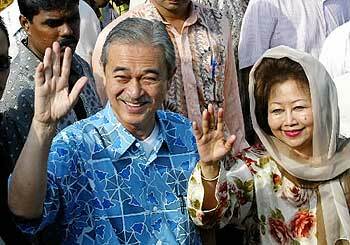 Former Malaysian Prime Minsiter with wife Endon. 20 Oct. 2005 ............. and probably always will. "I am happy to say that the Malays in Malaysia are the most tolerant Muslims I know and the present government we have (ruling since Independence) is very tolerant when it comes to other religions. The only flaw is that there is a law against Muslims converting to another religion but not vice-versa. I have no hang up about that because I believe Islam is one of the best religions in the world and thus see no reason for any Muslim to convert. The way it is practiced by some in many parts of the world leaves much to be desired and due to these people the religion is nowadays very much misinterpreted. Namaste - i bow to the Ruh (Spirit/Shakti) of Allah who resides in you! "The nature of most Muslims—benevolent, liberal, modest, forbearing, patient, enduring, frugal, sincere, straight-forward, decent, lovers of peace and truth, and, above all, trusting in one God and submitting to His will"
v) those who have responded to His Call to bear witness to the Resurrection and His self-reproaching Spirit, and want i)-iv) not to miss their eschatological evolution? After reading Karen Armstrong's article (appended below) it becomes clear that the Quran never required conversion to Islam. Surah 5:69 declares that "All who believe in God and the Last Day and do righteous deeds—no fear need they have, and neither shall they grieve... The fact that this appreciation of other traditions is written into the archetypal myth of Muslim spirituality shows how central this pluralism was to early Islam. But many Muslims will still insist on conversion since they think "that the Qur'n claims that Islam is the one, true faith and that only Muslims will be saved.” But that obviously was never the case and Karen Armstrong nails it in Chapter 3 of Muhammad (Prophet For Our Time). i) Why should these Muslim disbelievers—who today not only reject Allah's Signs and surahs of the Holy Quran confirming commencement of Al-Qiyamah but also scoff His messengers warning them to respond to His Call—demand that the Believers—who after hearing the Great News (Al Naba) have surrendered to Allah's Call to witness the Resurrection and His self-reproaching Spirit—convert and become unbelievers like them? ii) Why should those who have submitted to Allah's Will and Command to participate and bear witness to the Resurrection convert to Islam today and revert back to Jahiliyyah (Time of Ignorance) and wait for 'graves to open up'? iv) In the first place, what knowledge does the ulema possess about Al Naba (The Great News)—the collection, promulgation, recitation and explanation of the Signs and surahs confirming the commencement of the Resurrection—that conversion to Islam is required to acquire it? Will the Ummah continue to follow the ignorant ulema or respond to His Call and follow His messengers setting forth the Sure Signs and warnings of the commencement of Al-Qiyamah? v) Last, but not the least, why and how are the Believers (the vast majority being non-Muslims) able to fully participate in the Resurrection and feels the Winds of Qiyamah without ever converting to Islam? So why are Muslims not feeling the Winds of the Resurrection? Is it because they are unaware it is taking place? Or is it that those who reject His Call will never? And if God had so willed, He could surely have made you all one single community: but [He willed it otherwise] in order to test you by means of what he has vouchsafed unto you. Vie, then, with one another in doing good works! Unto God you must all return; and then He will make you truly understand all that on which you were wont to differ. " The Quran is thus clearly against this ingrained Muslim compulsion to convert others to Islam and follow only Prophet Muhammad, to the exclusion of all other scriptures and prophets. Just like the Quran, She too invites all beings to accept and learn from each other's religion and prophets, and vie with one another in doing good works! According to Her there is no difference in the universal message of the prophets because “What Christ said, what Krishna said, and what Muhammad said is nothing but Advaita, that you have to become One with God.” The Quran too speaks with the same voice. In fact "one of the first passages in the Qur'n to emphasize the words"Islam"And"muslim," which both derive from the verb 'slama': "surrendering oneself entirely to someone else's will.” The verse continues: For if one goes in search of a religion other than self-surrender (islam) unto God, it will never be accepted from him, and in the life to come, he shall be among the lost. " The Quran is talking about nothing else but Advaita i.e., to become One with God! Only after Self-realization/Kundalini awakening/Second birth by Spirit (Baptism of Allah/ Sibghatu I-Lah) does that self-surrender to God during Al Qadr (Night of Destiny) become a reality. How much does the Ummah know about the Baptism Of Allah (Sibghatu I-Lah) and the Winds of Qiyamah that starts issuing forth from their hands, head and other parts of the body? Next to nothing! On the other hand the vast majority of kaffirs, both Muslim and non- Muslim, do not even know the Resurrection is taking place. Shri Mataji questions the Muslims; “Are they going to miss it?” Those who do not indiscriminately follow the revelations of every single one of God's messengers, as directed by Allah, surely will. And if you do not follow His Ruh (Spirit/ Shakti) who has collected, promulgated, recited and explained the Signs and surahs commencing Al-Qiyamah, without question, you will. Period! "The story of the night journey reveals Muhammad's longing to bring the Arabs of the Hijaz, who had felt that they had been left out of the divine plan, into the heart of the monotheistic family. This is a story of pluralism. Muhammad was abandoning the pagan pluralism of Mecca, because it had degenerated into the self-destructive arrogance and violence of jahiliyyah, but he was beginning to embrace monotheistic pluralism. In Jerusalem, he discovered that all the prophets, sent by God to all peoples, are"brothers.”Muhammad's prophetic predecessors do not spurn him as a pretender, but welcome him into their family. The prophets do not revile or try to convert each other; instead they listen to each other's insights. They invite the new prophet to preach to them, and, in one version of the story, Muhammad asks Moses for advice about how frequently Muslims should pray. Originally, God wanted salat [the ritual worship performed five times a day by Muslims] fifty times a day, but Moses kept sending Muhammad back to God until the number of prescribed prayers had been reduced to five (which Moses still found excessive). The fact that this appreciation of other traditions is written into the archetypal myth of Muslim spirituality shows how central this pluralism was to early Islam. Say: We believe in God, and in that which has been bestowed from on high upon us, and that which has been bestowed upon Abraham and Ishmael and Isaac and Jacob and their descendents, and that which has been vouchsafed by their Sustainer unto Moses and Jesus and all the [other] prophets: we make no distinction between any of them. And unto Him do we surrender ourselves ('lahu muslimun'). This verse is often quoted to"prove"that the Qur'n claims that Islam is the one, true faith and that only Muslims will be saved. But"Islam"Was not yet the official name for Muhammad's religion, and when this verse is read correctly in its pluralistic context, it clearly means the opposite. Ibn Ishaq, 'Sirat Rasul Allah', 271, in Guillaume, 'Life of Muhammad'. Qur'n 3:84, cf. 2:136, Asad translation. Toshihiko Izutsu, 'Ethico-Religious Concepts in the Qur'n' (Montreal and Kingston, ON, 2002), 189.